Welcome to the Motor City, Koenigsegg. It all happened on an 11-mile stretch of highway outside of Las Vegas last November. The (an average calculated after two runs), making it the world’s fastest production car. And now that very car, wearing the exact same set of Michelin Pilot Sport Cup2 from that record-breaking run, is on display at the Detroit Auto Show. Founder Christian von Koenigsegg is also on hand to bask in the glory his car achieved, and his American audience is rightly in awe of the Agera RS on the stand. It looks wonderfully ridiculous mounted on the display platform with that one mega-watt engine with 1,360 hp and 1,011 lb-ft of torque fully exposed. Koenigsegg teamed with Michelin to make the display possible, so no other Koenigsegg supercars are hand. 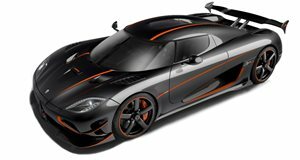 This is also the Agera RS that achieved two other records, the Flying Kilometer on a public road at 445.54 kmh, and the Flying Mile on a public road at 276.36 mph, both of which were calculated after running the car in two directions. Koenigsegg also added both of those records previously stood for 80 years, set by Mercedes-Benz on January 28, 1938 with a recorded average speed of 432.7 kmh, or 268 mph. This was done in a modified version of the Mercedes W125 racecar along a section of the Autobahn. But records are meant to be broken, eventually. We're sure both Bugatti and Hennessey are plotting their own top speed runs, but right now that title belongs to this very Agera RS. Welcome to the Motor City, Koenigsegg. Everyone is glad you dropped by.